Sight map of this website. I cannot bend my knees due to my folly of falling off the treadmill 2 days ago, but I can map the globe. It is only Day 6, but every single day is full, fulfilling and meaningful for me. Today I take part in a mapmaking workshop at the British Library. This is my first ever workshop. I go as my current shape, a hamster. No one laughs at me, or find me strange- if they do, they do not show it. This is what I love about Nondon – that every one is different, every one has an accent, every one is as ‘entitled’. (To be sure, this is not what all Nondoners think, and certainly not what the Nick Griffin or the members of the BNP [thats’ the Banque Nationale De Paris , for the non British out there] think, I think). There are many exquisite maps at the British Library. (Like the British Museum, there are many, many, many things in the British Library. One of the reasons as we all know quite well is that they, well, ‘appropriated’ many things from all over the world during the glorious days of imperialism, but Kaidie, a 3rdlifer, while aware and conscious of course of these discourses, is free from the baggage and burden of history/histories. As well as taste, some might say, looking at my map, above). After the workshop, I walk down the Euston Road, which leads to Marylebone Road. 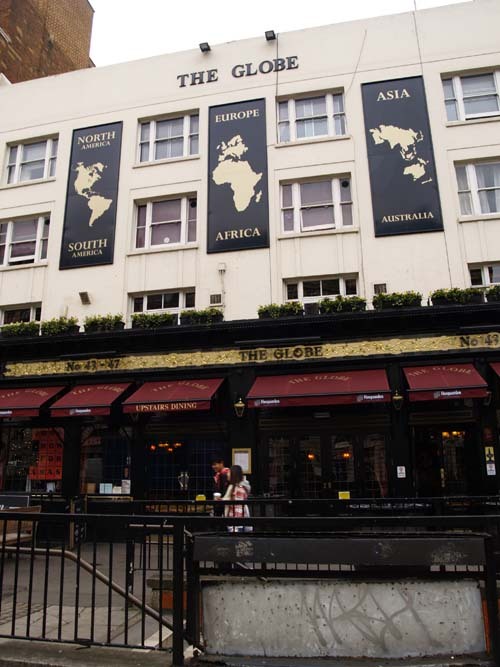 Opposite the Madam Tussaud’s Museum (which is full of my impersonator friends), is a pub named the Globe (see below). As a true-blue cosmopolitan Nondoner, I down 9 pints in quick succession in 6 minutes, of Hoegaarden, Asahi, 3 Moët et Chandon Brut Impérial, 2 Mojitos, washed down with 2 straight vodkas. Burp. (In Life 3.0, there is no legal age-limit. Nothing is illegal, or nothing is legal either.) Refreshed from my small drink, I go home and make my own map (see above). We are told that there will be a big map show in April 2010 – either the show is a big show, or that the maps that are shown there are big, or it is a big show that shows big maps. Magnificent! I must go! I must put it down in my diary. Around the globe in 6 days. I MUST, MUST go as well to look at The Rubaiyat of Omar Khayyam show which closes 21 Feb 2010! I have just signed up to receive online newsletters. I must register to be a Reader as well. SO MUCH TO DO, AND SO MUCH TIME TO DO THEM ALL! How I adore Nondon! My Life 3.0 is a bed of roses. And fragrant proses. Sigh. Do not, my dear Readers, envy me please. Inequality is life. Such is life. Accept it! This entry was posted on Friday, December 18th, 2009 at 20:30	and is filed under A ROUGH GUIDE and tagged with london, mapping, meaning, meaningful, nondon, subjectivity. You can follow any responses to this entry through the RSS 2.0 feed. You can leave a response, or trackback from your own site. However why can’t I? What will happen? How does it impinge on my quest for The Meaning Of Life 3.0? I like, I mean NEED variety! Singularity bores me. I need a variety, a smorgasbord, a life buffet!! Is that too much to ask?